Being a Mom means that I have cleaned up my fair share of spills and messes and I know that I have years more ahead of me. If you know me, you know that when it comes to paper towels, I can be a bit of a snob. I need something that is going to work the first time, something that can withstand a large volume of liquid or a big mess. I also want something that I don’t need to use a ridiculous amount on because I do not like to waste. So, in other words, that means that I am always on the hunt for something that is strong, durable and does the job! Enter the NEW SpongeTowels Ultra Strong! They are said to be the ultimate in strength and absorbency and will help us Canadians tackle our toughest, real life messes and is now the strongest, most absorbent premium paper towel in the extensive SpongeTowels product line. The NEW SpongeTowels have what they call, Sponge Pockets— they are a unique, circular pattern that you’ll find on all SpongeTowels products. The SpongeTowels Ultra Strong are thicker, stronger, and more absorbent. Now, I know that those Sponge Pockets work because I’ve used SpongeTowels before, they pick up all that excess fluid and variety of chunks that you find in most messes! Several years in the making, SpongeTowels Ultra Strong is the result of major, Canadian research and development to create the best combination of absorbency and strength. Canadian consumers are looking for premium product performance so they can use less to get the job done. The premium pack design maximizes shelf impact and is sure to attract consumers’ attention in store. Ultra Strong. Ultra Absorbent. NEW SpongeTowels Ultra Strong is now available in 2-roll and 6-roll formats in a Choose a Size® format that allows you to use as much or little as needed. The complete SpongeTowels product line is available in leading retail, grocery and drug store chains across Canada. You gotta love these SpongeTowel guys! I always joke around that I’d love to have a whole fleet of them with me at all times to soak up any messes along the way. But, in reality, they are kinda always there in my paper towel holder–ready to soak up whatever I throw their way. So trustworthy, loyal and there to lend a hand. Like I said, paper towel snob here and I love ones that work! 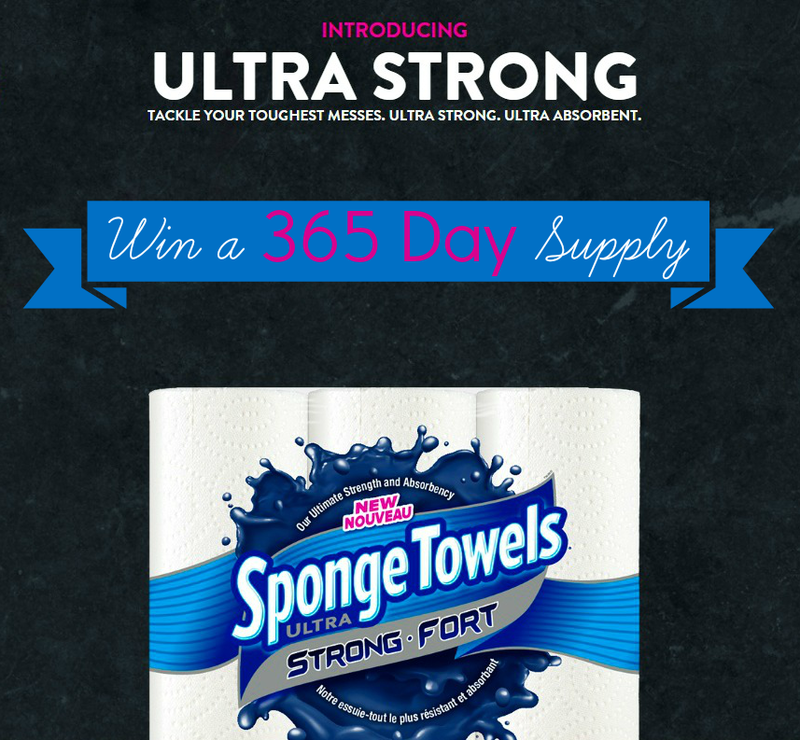 One lucky Whispered Inspirations reader will WIN a YEAR SUPPLY of SpongeTowels Ultra Strong! That’s a whole lotta awesomeness to clean up a whole lotta messes! This contest opens on February 17th, 2015 and ends on March 4th, 2015. Open to Canada only! Make sure you head over to SpongeTowel’s Facebook to see the latest updates! You can also visit SpongeTowels.ca and get information on their entire line, including the SpongeTowels Ultra Strong. Who in your family is the culprit of messes? Previous Post: « Throw a Valentine’s Day Cocktail Party with Luksusowa & These Cocktail Ideas! Toss up between my teen and my 5 year old! Mostly me when I bake. well, i think we are all equally as guilty of making messes – plus we have two dogs who are prone to make a mess as well! One of my three cats is the culprit. He seems to vomit often enough so this would come in handy. My son is always making messes and our dogs !!! My husband makes the biggest messes, then my kids and dogs. 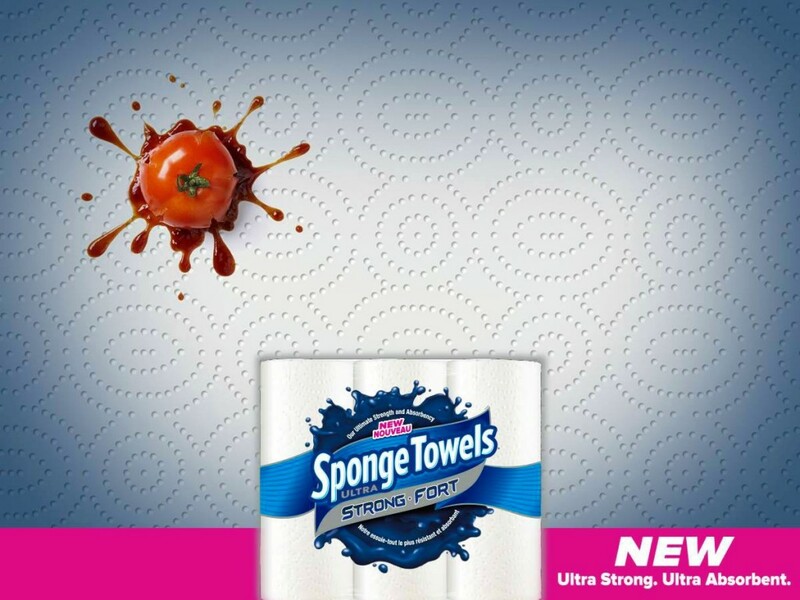 My kids tend to spill and leave big sticky messes that the new Sponge Towels Ultra would be ideal to help to clean up. my 5 year old nice is a messy one! My twins sons are the culprits in my house. I have a 4yr old…not to mention the dog….the cat….oh and I have a hubby too! Tons of messes everywhere! My husband. Just this morning I had to clean up dirty water from where he overwatered his Tomato plant he has growing by the kitchen window. My sister makes messes especially while cooking. The dog is usually the culprit! It would be great to win a year supply of SpongeTowels Ultra Strong. I am the messy culprit in my home. My partner but I think he'll be cleaning up his own messes! We have three kids and the spills never end i can't wash our tea towels fast enough or keep paper towels enough! I have been trying to cook and bake more lately so needless to say, I have been making a lot of mess in the kitchen. So now it's a tie between my dog and myself! Yikes. I think we all make messes in our own way. 4 pets are the culprits – 2 cats & 2 dogs! I'm the biggest culprit of making messes in my home when I'm cooking. My kitties are the culprits…always something being knocked over and….pee on the floor sometimes…eek! Often it's hubby with spaghetti sauce. My cats make the biggest messes. My dogs actually I think (barely) outmess my kids! My three year old. She spills more than the other two put together. I would have to say it would be me who is guilty of making messes. I love to cook and it always tastes fabulous but I am not neat in the least. These towels would come in very handy. My husband makes the biggest mess! My husband is our culprit. My kids are definitely the mess makers in my home! Well, I have 5 sons and a husband and 2 messy cats so I'm not sure… definitely my youngest 3 boys for sure though. My husband is the biggest culprit of spills. There are 4 adults in the household….and we are all culprits of being messy…..we go through a lot of paper towels in a run of a week….. It would be our two dogs who love the mud. so it would be great to win these SpongeTowels. My son. You name it, he spills it! Just last weekend he accidentally spilled half of his bottle of water into the computer keyboard. I'd love some Sponge Towels to the rescue! Mostly me. I make a lot of messes. I spill a lot. It`s a tie between my hubby and teen son!!!!! My son and my dog are both equally messy. I love sponge towels! The only brand I buy! Thank you for the chance to win! My 2 dogs, 3 boys, husband and myself! My husband like to let things boil over and make s messes. My four kids and husband who forget sometimes about wiping their boots before coming in the house! lol, my 3 cats. Hairballs are the worst 🙁 I woke up the other morning to a surprise from one of them in my slipper. My partner is the culprit! The other half makes all kinds of messes!!! My 8 year old is so messy, drives me nuts. Hubby and me, I suppose we can both be kinda messy ! Our new puppy sure laves some messes and so do my kids! I sure could use these paper towels! My husband and the dogs grrrrr, I actually think the hubby is worse than the dogs though, man child ugh!! My adorable three year old. Our pets make the most messes with their food. We're all guilty of this. My daughter is by far the messiest one in our house! I said the hubby, last night he said "no it's the kids" lol! Today the mess has been made by a certain orange & white kitty who knocked over a cup of coffee! I feel like I am the culprit of messes and spills! I am always missing the cup or bowl! I am seriously the worlds clumsiest person sometime so a year supply would be perfect for my lifestyle! I hate to admit it but it is me! and i use a lot of paper towels. Unfortunately that would be me. I love to cook and bake, but I am not the neatest one around. lol. Always lots of flour and stuff everywhere! my sons and their friends…! My fiance and my 2 blind cats are tied when it comes to making the most messed! And it's always me cleaning up! My daughter. She's a creative, messy girl. Our two year old makes the most messes. I make my fair share of messes – but I put most of the blame on two furbabies who love to barf up hairballs on my nice beige carpet. We blame the dog a lot too. I would be the culprit! Always in a hurry so always making messes! I am the messy culprit in my house and i use a lot of paper towels to clean up my messes. Usually the pets make most of the messes in the house, 2 dogs & 2 cats will do that! To be honest, it's me – I am a big clutz. My partner is pretty messy!! Mainly my sons are the mess makers! My son is quite the culprit at spilling things, and my dog too, always wet feet trapsing across the floor. It is a tie between the pets and the teens. Cannot keep up with either one's messes. It is a true fact our paper towel holder is always empty as a result of all of them. My little girls make messes sometime. My partner is the messy one in our house. I'll have to clean up after myself. the kids hands down! messes in every room it seems! I am the culprit in my home who makes the messes. I need to win a years supply of SpongeTowels Ultra Strong. Pets make the most of the messes that need to be cleaned up. I make A LOT of the messes in our house lol and I can go a little paper towel crazy when cleaning it up. My kids, especially when they are snacking on popcorn. My better half seems to always miss his cup just a little when he is pouring his coffee. I think both my partner and I contribute to messes. That would usually be me. My son is. Okay, hubby is as well!! Today it seem to be me making all the messes, I have cleaned up several in the kitchen today. Good thing for paper towels! My adventurous and curious kids! Yesterday my little nephew was the culprit! I am the messy culprit in my home and i love SpongeTowels. My kids -especially when there is popcorn on the go. My new puppy certainly is making the messes in our home! My daughter. She's adorable and messy. I think we all contribute but I think I clean the most! I'll have to admit, mostly me. My husband is the messy culprit in our home. I am the messy one. I need some SpongeTowels to help me clean up if i spill my coffee. My son, I can always tell what hes been up to by the trail of messes left behind him. Thanks for the chance at this great giveaway. I have my 2 grown sons staying with me (temporarily) and they are both the Culprits to the biggest mess makers. I guess they figure Mom will clean it up lol, and thats where the Paper Towels come in handy…lots of them. Im pretty messy when im baking! Sometimes it's my 2 little dogs who are guilty! Four pets make lots of messes that need to be cleaned up! My son makes the most messes that I have to clean up. Miss Sophie is the mess maker but she's getting good at cleaning them up. It is usually me who does the spilling in my house! I have five year old twins, equally messy. My cat, Peanut. She's always knocking over everyone's drinks. My three littles. They're cute and messy. Definitely the pets make the most messes, especially the one cat with her hairballs! The biggest culprit is my two year old son although everyone contributes haha! My kitty makes a mess sometimes too! I think we all contribute to the mess! and i use SpongeTowels to clean up my messes. Our dog, Dexter, after a romp in the snow. my 3 cats keep me cleaning up messes alot! My son Adrian is the culprit who makes the most messes in the house. My grandkids can make really big messes. Testosterone Tag Team – Husband/Son ! The messy duo – coffee spills, popcorn seeds/niblets on the carpet – gatorade spills…*Help* Spongetowels…. My hubby after working outside! My darling little girls spill a lot. Sippy cups with lids are the order of the day. The snow makes a big mess coming in my house! my daughter with her craft messes, use alot of paper towels! my hubbie is a great but messy cook. i have 4 grandsons 5 and under. need i say more? My daughter Brooklyn she thinks messes clean up themselves. could totally use these. with kids and two large dogs i go through alot! I am the messy person in my house. It's easy to make a mess but it's even easier to clean it up with SpongeTowels. My husband is the messy one! Would love to win Sponge Towels. They do the job! I make the most mess. My pets are the mess makers! My poor little kitty Minnie! She has a sensitive tummy and, well, she leaves surprises for us to clean up. I'm the culprit – I'll have to use the Sponge Towels to clean up after myself! Everyone but me ! Nobody notices the little spills and messes they make…..
Two young boys would be thought to make the messes. But it's really my husband haha! My doggie makes the most mess. I clean his paws when he comes in from outside. I’m the culprit in my home! I am known to make quite a few messes myself especiually during visits from the grandkids. Usually it's my 9 year old daughter, but my dogs sometimes have their accidents or drools, too! My daughter is 21-months-old and is an enthusiastic, yet messy, eater. My foster dogs, I would not survive without paper towels! Uh,,, Hands down my husband is the culprit! I nicknamed him "Linus" – No matter where he goes, there is a trail of…something haha. My husband is the messy one, can never seem to clean up after himself. Sponge Towels are great. I would have to say one of the cats. She has a tendancy to want to spill over your cups and drinks lol. Thanks so much for the giveaway ! My kids are the culprits always spilling food everywhere! My middle daughter is a mess maker. I think the biggest culprits are me and the dogs!! My sister does all the cooking so I have to put the blame on her! But she is a good cook. My cats, dog and 2 teenagers. My husband is the messiest person in the house. I will have no trouble at all using a 365 day supply! lol! My cat, Misty, makes the most mess in our house. I clean up after my own messes. Everyone can clean up their own! My son tends to spill whole glasses of liquids quite often-but my family are all pretty messy-this would be a great win for us! The winter makes a mess in my house too! All the salt gets dragged inside! and i need some SpongeTowels to clean it up. My daughter is the messy one at our house.She leaves a trail of whatever she is drinking behind her wherever she goes. My roommate has really bad luck in the kitchen and makes a lot of spills. We also have a new puppy that is 12 weeks old and isn't yet potty trained! My husband and his messy workboots! Definitely pet messes in our house! Me and my kitty make all the mess in my house! I am the person who makes the messes in my house. I don't make a lot of messes but when i do i use SpongeTowels. the step grandkids when they come to visit! My doggie cause he can't wait to get back into the house no matter what the weather is outside. me – SpongeTowels are an absolute necessity! Ah we are all culprits! Paper towels always come in handy with 4 pets and their messes! so i need SpongeTowels because they work great to clean up spills. My son is the culprit who makes the most mess in the home. Not sure , I could blame the kids , dog or Hubby , but I am saying the kids ! We have a new puppy and wow, there are some messes! I'll have to admit it's me. We are all culprits sometimes! Hubby makes the most mess. My husband always leaves a mess in the kitchen. there is an anonymous person in the house – never seen – "I didn't do it". I have spilled coffee twice in the last week! My three year old is the culprit! and SpongeTowels are very handy to clean up any mess. I made spaghetti last night and dropped a plate of it on the floor…sauce everywhere. Our pug, Dexter and his wet feet! Usually our four pets are the one's making the messes, spilled water dish, hairballs, knocked over glasses, dirty paws…and more! there's only the two of us now, so it's still my son and he's 28! It's the only brand of paper towels i buy. My doggie loves going outside and then brings in dirt, so he lifts his paws to be cleaned. My daughter seems to be a magnet for spills. I have a cat who insists on dragging his dish of cat food around the room I feed him in. She drips food on the floor and spreads certain dry cat food all over the place. Thank goodness for Sponge Towels to clean up her messes. My middle daughter. She loves to make messes. well I hate having to say this but since my son has now gone on holiday, it's me! That cat of ours makes a lot of messes! We are all guilty of making messes here! i am glad i have SpongeTowels to help me clean it up. I think my partner and I are both a bit on the messy side. I am the messy culprit who makes the messes in my home. SpongeTowels are great to help me clean up my mess. My youngest daughter is our up and coming mess maker. The mess culprit in this home is my 3 year old daughter who feels it's her right to be able to go into the fridge & pour herself a cup of juice or almond milk. Just yesterday I had to clean up a full 2 L of almond milk that she dropped while I was in the basement getting the laundry. It was everywhere, even under the fridge. HELP! Four pets = lots of messes to clean up! my 2 boys sure know how to make a mess! All 4 of my kids, for sure! Our dog's paws are responsible for a lot of floor mess these days. My dad is the culprit in the house that makes the most messes. He has FXTAS which makes him shake like crazy, So holding a fork, bread, glass, cup is very difficult. hahaha my daughter… never fails.